This frame grab from a video released Nov. 2, 2017, by the Syrian official news agency SANA shows smoke and debris rising after Syrian government shelling of the Deir el-Zour city during a battle against Islamic State militants. A large military convoy from an Arab country was deployed last week to the eastern Syrian province of Deir el-Zour, where U.S.-backed forces are fighting the Islamic State (IS) terror group, a monitor group told VOA. The convoy belonged to a country that is part of the U.S.-led coalition against IS, the Britain-based Syrian Observatory for Human Rights reported. “Our sources on the ground spotted the convoy near the eastern bank of the Euphrates River, where IS still maintains a small presence,” Rami Abdulrahman, director of the Syrian Observatory, told VOA. 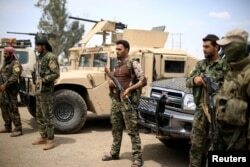 For months, the Kurdish-dominated Syrian Democratic Forces (SDF) have been fighting IS in eastern Syria with the help of the U.S.-led coalition. The group has liberated large swaths of territory from IS in recent months and the fighting is currently concentrated in several towns that are still held by IS along the Euphrates River Valley. SDF officials declined to comment on the subject. But in the past, the SDF has welcomed the idea of an Arab force in areas under its control. FILE - Fighters of Syrian Democratic Forces (SDF) stand guard in Deir al-Zour, Syria, May 1, 2018. Some analysts, however, said that sending a regional Arab force to that part of Syria could mitigate ethnic tensions between Kurds and Arabs. “At present, some tension has been caused between the Kurdish-dominated de facto authorities in Raqqa and Deir el-Zour and the Arab population in parts of these provinces,” Spyer added. Eastern Syria, particularly Deir el-Zour and Raqqa, is an Arab-majority region, while Kurds and other ethnic groups are considered to be a minority. Syrian Democratic Forces and U.S. troops are seen during a patrol near Turkish border in Hasakah, Syria, Nov. 4, 2018. The Pentagon said it has about 2,000 U.S. troops in Syria, where they have been instrumental in the fight against IS. U.S. officials have said that American forces will not leave Syria until IS has been defeated and Iran has exited the war-torn country. Iran has been a major supporter of Syrian President Bashar al-Assad’s regime since the outbreak of the country’s civil war in 2011. But Ambassador James Jeffrey, the U.S. special representative for Syria, said that Iran’s involvement in Syria was part of a larger plan to expand its presence in the Middle East. “Iran’s presence in Syria, particularly its power projection — that’s long-range missiles and air defense systems — has nothing to do with defending the Assad regime against the opposition,” Jeffrey said in an interview with Alhurra TV on Wednesday. It has "everything to do with projecting power,” he added. In addition to the U.S., Gulf countries, particularly Saudi Arabia and the United Arab Emirates, have long opposed an Iranian presence in Syria, Yemen and other parts of the Middle East. And the recent alleged deployment of an Arab force to eastern Syria would likely be aimed at stopping Iran from expanding its influence in the region, some experts say. 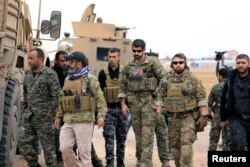 “It is clear that the U.S. now considers its presence in eastern Syria as an element of the effort to contain and roll back Iran, and is not planning to quit the area in the near future,” analyst Spyer said. But other analysts, like Alex Vatanka, who is a researcher at the Middle East Institute in Washington, say that having more foreign forces in Syria could complicate an already complex situation. “Inflowing new forces into the game at this timing is very peculiar and will add to the complexity of the equation, considering the fact that we don’t know what country these troops are from,” Vatanka told VOA. Babak Taghvaee, a military analyst based in Malta, links the deployment of an Arab force in eastern Syria to recent tensions between Turkey and the Kurdish-led SDF. “It sends a message to Turkey that if Americans can’t support SDF enough, then they have support of their allies from [the Gulf states],” Taghvaee said. Turkey views the People’s Protection Units (YPG), the main element within SDF, as part of the Turkey-based Kurdistan Workers’ Party (PKK), which has been engaged in a three-decade war with Turkish armed forces for greater Kurdish rights in Turkey. In recent weeks, the Turkish military has targeted YPG positions in several border areas between Turkey and Syria. Hoping to ease tensions between the two sides, U.S. Defense Secretary Jim Mattis said Wednesday that the U.S. was setting up “observation posts” along parts of Turkey-Syria border.